A convenient push-on push-off button switch to turn your LEDs on and off. 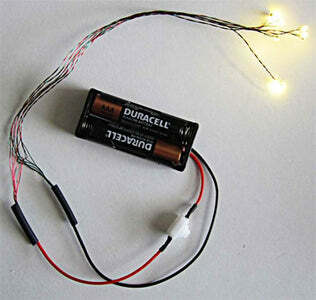 This is another way to run your 3 volt LEDs. 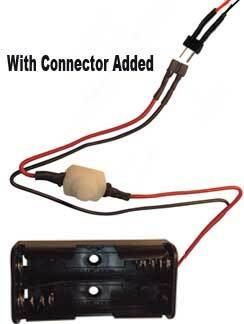 This 3 volt output AAA holder can run chips, 1.8mm, 3mm, 5mm or a mix of all sizes at once. And it can run more lights for longer than a coin cell holder/coin cell. the LEDs are connected the red wire to the red lead. And black-to-black. Protect connections with tape or shrink tube. 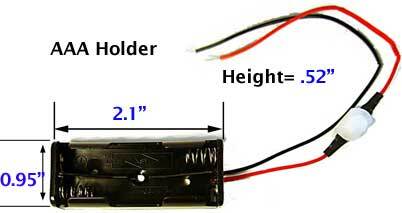 In our tests, the AAA holder can run 20 LEDs more than the cr2032 coin cell holder. Get our AAA holder with a connector added. This is convenient when you want to replace the batteries, or if you just want to remove the batteries when you move the project around. The AAA holder has the "female" socket and you get a "male" plug with 8" red and black Kynar with this unit. Connect your LEDs to the wired male connector, then plug the LEDs into your battery.